The Anchorage School District is considering changing when students start and end classes. Open-house events about the possible changes begin Thursday. The School Board is expected to make a decision in early October about whether to shift school schedules. Any changes would go into effect next school year. 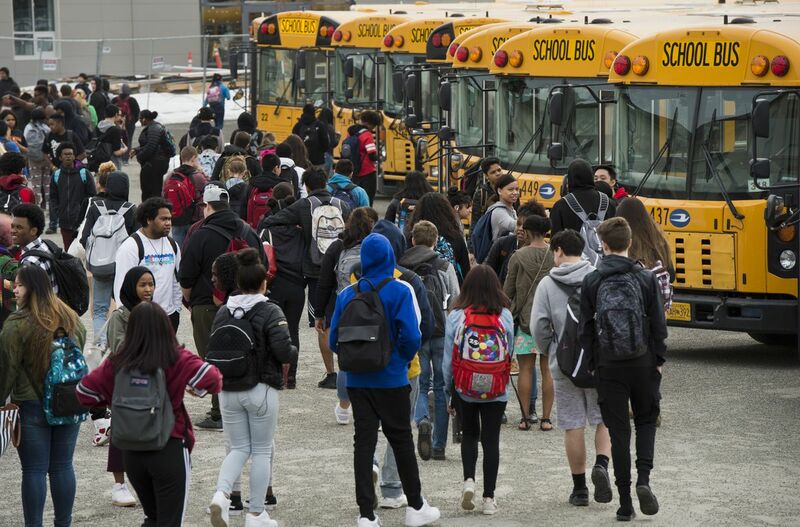 Here are a few things to know about the potential start-time changes, including how Alaska's largest school district got here and what's next. How does the district want to change school schedules? — High schools start and end 30 minutes later, with classes from 8 a.m. to 2:30 p.m.
— Middle school schedules move one hour and 15 minutes later, with classes from 9:30 a.m. to 4 p.m.
— Elementary school schedules shift 15 minutes earlier, with classes from 8:45 a.m. to 3:15 p.m. It would allow older students to get the benefits of starting school later than they do now, Bishop said at a school board work session in August. High school students would also still finish their classes first, so they could take care of younger siblings after school if needed. Bishop has noted, however, that her recommendation doesn't move high school start times to 8:30 a.m. or later as recommended by some national organizations, including the American Academy of Sleep Medicine and the American Academy of Pediatrics. "We're helping them a little bit," Bishop said in August of the district's high school students. "We're moving toward positivity." A few other start-time scenarios had been discussed at School Board meetings before Bishop made her recommendation. The district must have different start times for elementary, middle and high schools unless it wants to spend millions of dollars more on busing, Bishop has said. For instance, if the district wanted middle and high schools to start at identical times, it would cost about $9.5 million for additional buses plus about $7.7 million more each year in operational costs, according to a presentation in May by Shannon Bingham, owner of the Colorado-based consulting firm Western Demographics. The district hired the firm to study the start-time issue. So the superintendent has recommended a change. What happens next? The district will hold three open-house events this month about the possible changes. Anyone can attend, said Catherine Esary, school district spokeswoman. Each will start with a brief presentation followed by time for questions, she said. There will also be informational display boards about the proposed changes. Who decides whether Anchorage schools' start times will change? Bishop's recommended start-time change is expected to appear on the agenda for the board's Sept. 24 meeting, Esary said. The board will likely vote on it on Oct. 8. If a majority of the board doesn't approve the recommendation, school schedules will remain unchanged. The board could also decide to change the recommended schedule shifts. If the School Board approves a schedule change, when would it go into effect? At the start of next school year, in August 2019. Why is the district considering changing school schedules? The School Board requested the district administration explore the start-time issue in summer 2017. Tam Agosti-Gisler, then the board president, said it was time for the district to revisit the issue, especially if changing start times could improve student learning. That summer, a West High student had also started an online petition calling for the district to push high school start times to 8:30 a.m. The petition had just over 5,400 signatures on Friday. What're some of the pros and cons of changing school schedules? The district says on its website that it's considering changing start times because research says high school students should start classes later. Later start times have shown to improve student performance and wellness, it says. Also, the district says, research suggests elementary school students get up early and get tired by midafternoon, so they could benefit from starting school earlier. The district and parents have also identified possible negative impacts of shifting schedules later for older students and earlier for younger ones, Bingham, the consultant, said this year. That includes concerns about child care and less time for older students' after-school sports and jobs. Dr. Ross Dodge, medical director of sleep medicine at Peak Neurology and Sleep Medicine in Anchorage, said in an interview Friday that he was supportive of Bishop's recommendation. While the American Academy of Pediatrics recommends middle and high school start no earlier than 8:30 a.m., he said, school districts must also face the realities of society, including child care, work schedules and more. "I think she made a good decision, probably having to balance input from many, many parties," he said. It's hard for adolescents to go to bed early and wake up early because of a shift in their internal clocks, he said. He called it an "internal biological phenomenon" that "occurs among all humanity regardless of where you live on the globe." The shift can make it difficult for teens — who need 8 to 10 hours of sleep — to fall asleep before 11 p.m., according to the National Sleep Foundation. Other school districts that have moved start times later for older students reported increases in students' grades and test scores, as well as decreases in absences, tardiness and sick days, said Chris Jung, an assistant professor at the Department of Biological Sciences at the University of Alaska Anchorage. "So if you're a student, it's a total win," he said Friday. "No question." Has Anchorage considered changing school start times in the past? Yes, and the School Board ultimately decided in 2002 to not change schedules. The board sided with then-Superintendent Carol Comeau, who said the district should continue researching the issue because there was no community consensus about what to do, according to a Daily News article from the time. Have any other school districts in Alaska changed their start times? The Matanuska-Susitna Borough School District shifted its school schedules starting in the 2011-12 school year after parents and students asked the school board to make start times later for older students, said Jillian Morrissey, district spokeswoman. The first year, the district moved start times back 15 minutes — to 7:30 a.m. for middle and high school students and 9 a.m. for elementary school students. The next year, it moved schedules again by 15 minutes, to 7:45 a.m. and 9:15 a.m. After that, elementary parents told the district they didn't want schedules moved any later, Morrissey said. The Juneau School District changed its school start times beginning in the 2009-10 school year — essentially swapping high school and elementary school schedules, said Kristin Bartlett, district spokeswoman. High school classes now start at 9:15 a.m. and elementary school classes at 8 a.m. Middle schools start at 8:30 a.m.
Last school year, the Kenai Peninsula Borough School District implemented a change to its busing system for schools in the Homer area as a way to save money, said district spokeswoman Pegge Erkeneff. Instead of having a larger fleet of buses take all students to school at the same time, it staggered schedules. Now, most elementary school students in the Homer area start classes at 7:50 a.m. or 8 a.m., while middle and high school students start at 9 a.m. Before, the schools started at 8:30 a.m., with a few exceptions. What about schools outside of Alaska? Bingham, the consultant, said dozens of schools have done away with start times before 8 a.m. Start School Later, an advocacy group, says hundreds have made changes to start times. "The Anchorage proposal has retained high school in first position, which is unique among districts converting, and this represents a compromise with the parent community," Bingham said in an email. Districts that have made changes include Seattle Public Schools. Its school board voted in November 2015 to have middle and high schools start later, The Seattle Times reported. It modified schedules again in 2017 after receiving a grant from the city, according to the newspaper. Now, most elementary schools start at 7:55 a.m. and middle and high schools start at 8:45 a.m. or 8:55 a.m. Schedules changed at the Bellingham Public Schools in Washington last year. Elementary schools start at 8 a.m., high schools at 8:30 a.m. and middle schools at 9:15 a.m., according to The Bellingham Herald. West of Minneapolis, Wayzata Public Schools shifted start times in the 2016-17 school year. It joined several other districts in the state that had already swapped start times for older and younger students, the Star Tribune reported. In Wayzata, most elementary schools start at 7:45 a.m., high schools at 8:20 a.m., and middle schools at 9:10 a.m. In California, the Legislature passed a bill in late August that would require all public middle and high schools to start at 8:30 a.m. or later, the Los Angeles Times reported. The bill was sent to the governor.